WELL ...Let me tell you! Savia is the reason I entered the wacky and wonderful world of Blogging. Savia is also my technical support person. 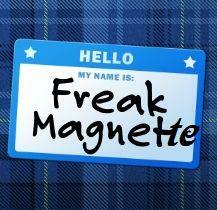 My name is Freak Magnette and I am technologically challenged! So challenged in fact, I can barely keep the terms upload and download straight. This past year I learned how to download pictures from my camera...or is it upload? Photocopiers intimidate me, in fact they may be smarter than I am. And GPS ...and Google Maps... seems like magic to me!! Anyway...I am getting off topic. To make a long story short, I was going to log on and draft an entry about my Strange Sunday. "___________is now following you on Twitter." It was at that time the Rockin' Robin song started playing in my head. OK not REALLY playing in my head... but that is what I thought of. The next thing I wondered was...how did this happen?... OH MY the pressure! Savia, are you my Twitter-setter-upper? The bored young salespeople watch me walk around for a bit as I stare longingly at the hand held little wonders. Gum Chewing Salesgirl: Can I help you? Me : Um... I am just looking for now, thanks! Gum Chewing Salesgirl: Are you looking for an upgrade? Me: No.. I am just pricing out the phones, I feel as though I am the only person without one. Me:nope, I would like one though. I have a "First Timer" here! Open-Mouth-Breather: (bored) Oh..Yeah I guess they still exist. Me: I giggle nervously and feel very freakish indeed. I am certain both of these young salespeople came out of the womb with a cell phone in hand. SOOOO If you are reading my tweeting, thanks. Like I said........ I have a long way to go! I had a feeling you would wonder WTF was going on when you started getting Twitter emails when you didn't even know what Twitter was. Don't worry, I'll walk you through it! Also, it's very sad that I'm your tech support person, because I usually don't know what the hell I'm doing. We're both in for a world of pain, I think. But in the meantime, I'll pretend I'm a guru and you can be my grasshopper. One of your lines reminded me of a New Yorker cartoon that has a newborn nursery and in one crib there's a baby texting: "OMG! I AM BORN"
Let's examine. Was this a meat market? Did anyone act freaky before midnight? Between midnight and the banana consumption? Mc Bar...and Happy Birthday Canada! !